One size of loss does not fit all in Manchester by the Sea. Plenty of filmmakers have a favorite thematic subject. Few filmmakers, however, have shown Kenneth Lonergan's willingness to look at that same subject from so many distinct perspectives. Grief has permeated Lonergan's films ever since he expanded his work from the stage to the screen, going back to his 2000 film debut You Can Count on Me and his little-seen masterwork Margaret. In all those works, he has poked around not just at how people respond to tragedy, but at how someone else might respond to that same tragedy in a completely different way, or even not take that individual grieving process seriously. 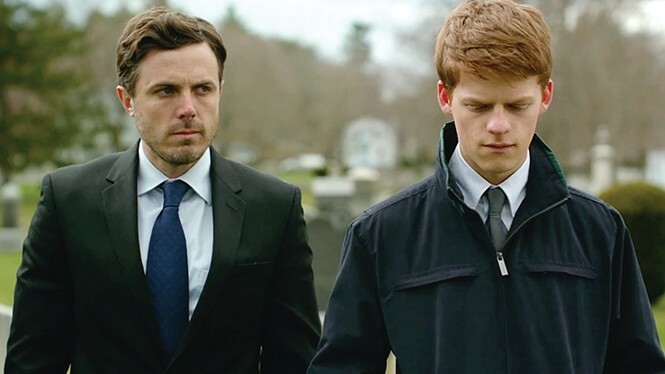 In his mournful, prickly Manchester by the Sea, Lonergan again dives into that same territory, emerging with yet another singular character study about wounded people trying to find peace, in ways that often leave them feeling desperately alone. The story opens with Lee Chandler (Casey Affleck) working as a handyman in several Boston area apartment buildings, seemingly disconnected from anyone and everything but the people whose toilets and showers he repairs. Then he gets news from his coastal Massachusetts hometown of Manchester-by-the-Sea that his brother, Joe (Kyle Chandler), has finally succumbed to a long battle with heart disease. What he does not expect upon his return—to a place filled with ghosts, and where everyone speaks his name like he's a local boogeyman—is that Joe has named Lee as the guardian for Joe's 16-year-old son Patrick (Lucas Hedges), forcing Lee to confront a past that has left him broken. Lonergan doesn't play coy for too long with the circumstances behind Lee's perpetual thousand-yard stare, making it clear early on that it has something to do with his separation from his now-ex-wife, Randi (Michelle Williams). Affleck's performance percolates with inward-turned, inarticulate rage, sporadically erupting in unprovoked attacks on whoever happens to look at Lee cross-eyed in a bar. It's a phenomenal piece of film acting, a portrait of unprocessed pain that electrifies one of the year's most heartbreaking scenes, as Lee and Randi unexpectedly meet in the middle of the street—Randi pushing the stroller with her new baby—and can barely find a complete sentence that will bridge the distance between them. Yet as indelible as Affleck's work is, Hedges' performance as Patrick proves nearly as important to Lonergan's storytelling. His response to the death of his father—for all practical purposes his only parent, after the departure of his alcoholic mother (Gretchen Mol) from his life—is more or less to continue with life as normal: hanging out with friends, bouncing between his two girlfriends, practicing with his hockey team and his band. When Patrick has his one out-of-nowhere breakdown—inspired by something as mundane as struggling to close a freezer door—it becomes a reminder of how different his experience of loss is from that of his uncle, and how even their decision regarding whether or not to say a last goodbye to Joe might come from completely different places. It would be tempting to look at those ideas and think Manchester must be a depressing slog, but Lonergan is far too savvy a writer for that. He shows off a wicked sense of humor, finding uncomfortable comedy in situations like Lee doing a miserable job of serving as Patrick's wingman chatting with the mother of the girl Patrick is trying to sleep with. The town of Manchester-by-the-Sea becomes a richly detailed part of the film, its residents' salty tongues providing an energy that never allows the sadness of the story to become oppressive. This is also a story, however, that refuses to see some magical healing properties in the relationship between Lee and Patrick, however much the two might need one another. Lonergan struggles a bit with folding his crucial flashback scenes into the primary narrative, but ultimately serves up haunting scenes that suggest some wounds never entirely heal, and some attempts to make amends for past mistakes will fail. Manchester by the Sea might be about grief, but it's never about grief as an abstract concept. In Kenneth Lonergan's world, adjusting to the scars that shape our lives isn't a one-size-fits-all experience.